Tierra Patagonia Hotel and Spa in Patagonia, Chile. Ranked #28 in our countdown of the 100 Best Hotels and Resorts in the World. 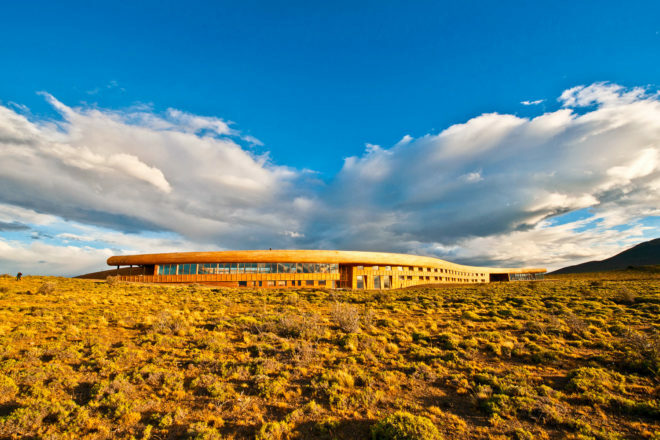 From a distance, the low-slung Tierra Patagonia Hotel & Spa appears part of the terrain; the aerodynamic form swooping out of the rugged Chilean landscape. Inside, nature dictates the décor. Raw native lenga woods, rustic leather and sheepskin throws, are an exemplar in understated luxury. Expert staff will organise excursions – from challenging treks to less arduous strolls. Soothe tired muscles with a Patagonian volcanic stone massage, a steam bath or the outdoor whirlpool with wild views of the Paine Massif, Lake Sarmiento and Torres del Paine National Park, just begging to be explored. Did you know Patagonia comes from Magellan’s 1520 description of locals as ‘patagóns’ – giants.